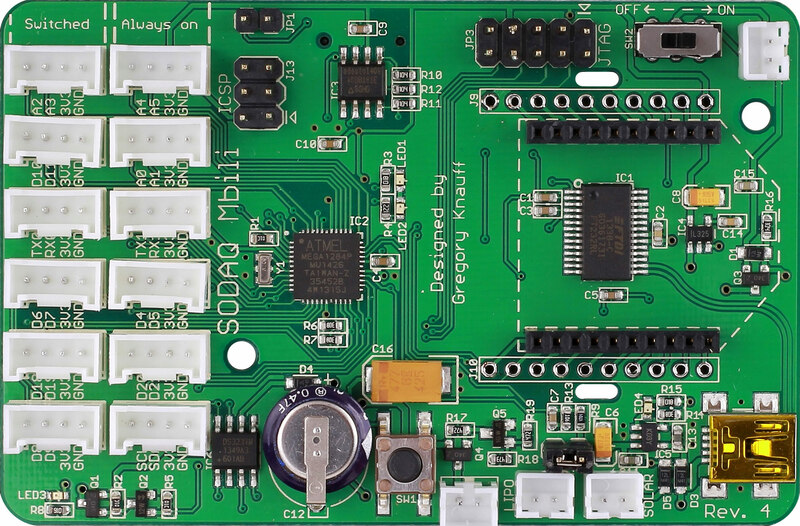 We have designed the new SODAQ Mbili (which means Two in Swahili) with all the input we got from our early adopters. What’s so great about the Mbili? The Atmega 1284P is the ‘big brother’ of the 328P. It has all the memory and program space you have been hoping for. It’s still a picopower chip, so it is ideal for low (solar) power applications. You can still program it with the Arduino IDE. The bootloader has been patched and the hardware files are available. Just recompile your sketches and you are ready to go. Two hardware serials (allowing USB and the Bee module to work at the same time). Micro SD card slot has been added for storage (as well as the existing Flash memory). Grove switched row now switches VCC (on the Moja it wasВ switching GND). Allowing for unpowered modules to be connected to the switched row as well. Additional I/O lines have been added, in total there are:В 6 analog lines, 10 digital lines, twoВ serial ports and the l2C В which are available through the Grove sockets. Switchable powersupply for theВ GPRSbee. Allowing for better control and complete power down of the GPRSbee module (saving several ВµAmps). For the pros, a JTAG interface has been added as well as a few more LEDs. A super-capacitor has been added for the Real Time Clock. This allows the RTC to remain ticking (for severalВ days) after the battery has been removed. Two machined 2 slots to tie-wrap down the Bee module! The board still runs on 8MHz and at 3.3V. We have produced a first batch which we are shipping now. The final production will be available from February 1st 2015.